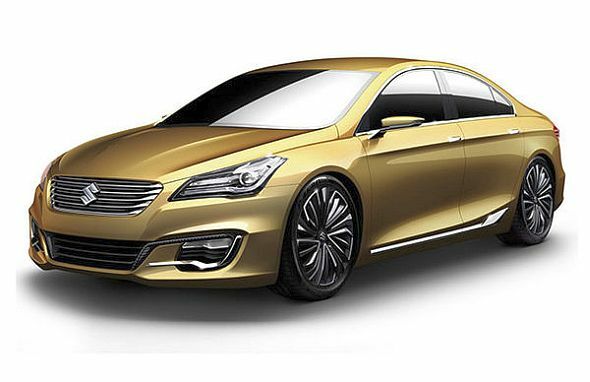 Maruti Suzuki Ciaz sedan car : September 2014 India launch and AMT gearbox on the cards? Maruti Suzuki Ciaz: September 2014 launch and AMT gearbox on the cards? In the latest buzz emerging about the Maruti Suzuki Ciaz C-Segment sedan, the car is touted for a September 2014 launch as the replacement model to the SX4 in India. The Ciaz, which took birth as the Suzuki AuthenticS concept, was showcased by Maruti Suzuki at the 2014 Indian Auto Expo. The car has been spotted testing in India, a precursor to the sedan’s launch here. The Ciaz could be the next Maruti Suzuki car model – after the Celerio – to be equipped with the automatic manual transmission (AMT). Like Tata Motors and Mahindra, Maruti Suzuki is betting big on the AMT technology, one with the potential to become as common place as the power steering and air conditioning features on modern day cars sold in India, priced under 10 lakh rupees. AMT technology, with its triple benefits of good fuel efficiency, lower cost and lower complexity when compared with traditional torque converter automatic gearboxes are set to become quite popular, as witnessed by the strong sales of the Celerio AMT. The Ciaz sedan will be based on the Maruti Ertiga MPV platform, The car will be powered by two engine options, a 1.4 liter petrol K-Series motor (94 Bhp-130 Nm) and a 1.3 liter Fiat Multijet diesel (90 Bhp-200 Nm) motor. Both engines will get a 5 speed manual gearbox as standard with the AMT gearbox likely to be offered as an option on both petrol and diesel versions of the car. The Ciaz will share its interiors with the Ertiga but is likely to offer a higher level fit and finish. The Ciaz will be Maruti Suzuki’s latest stab at the C-Segment sedan space, an area that it has been unable to crack with successive car launches such as the Baleno and SX4. Will the Ciaz help Maruti become a segment leader in the C-Segment sedan space? Time will tell. For now, here’s a quick glimpse of the Ciaz sedan, which was showcased at the 2014 Indian Auto Expo in concept form.